Photograph depicts an elderly couple standing to left of Sarah Glassey in hallway. Sarah holds a large certificate. Handwritten annotations on recto of photograph: "To dear Violet with love and happy memories, Auntie. 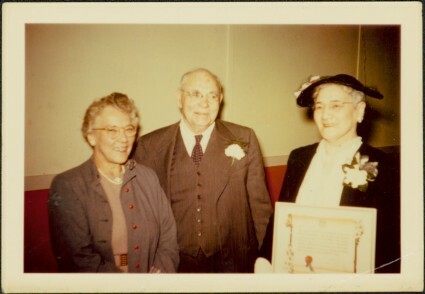 Aug. 4th 1959", "Auntie & the Tomlinsons receiving their certificates at the centennial for B.C. 1858 - 1958 - Auntie was born in 1881." Stamped annotation on recto of photograph: "Munshaw Colour Service Ltd. SEPT 22 1958".